Julie Beveridge launched herself off the front of the peleton only a few laps into tonight's Fulcrum Criterium women's race and stayed away the remainder of the race. Powering around the 1- kilometre course through downtown Banff, she continued to add to her lead, eventually lapping the entire field. 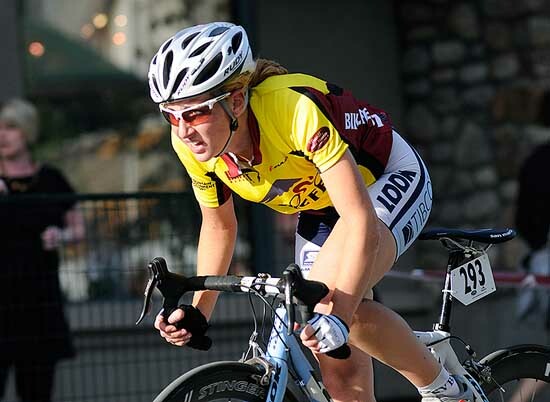 Laura Brown (Local Ride Racing) and Naomi Cooper (dEVo) led the following eight-rider sprint. 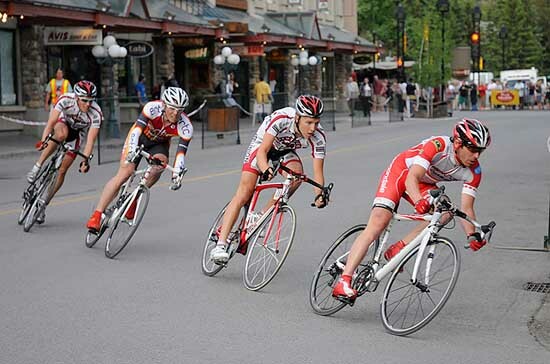 The men's race developed a four-man break midway through which stayed away to the finish. Despite a major solo effort, yellow jersey Jaime Sparling was unable to bridge up to his two Trek Red Truck teammates in the break. In the final sprint, Scott Laliberte (Westwood Cycle/Cannondale p/b Vision-Sports) nosed out Rob Britton and Dave Vukets of Trek Red Truck Racing and Paul Tichelaar of ERTC Revolution Cycle for the win. The peloton rolled through 24.2 seconds down. Category 5, 4, and 3/2 riders also provided entertaining racing for huge crowd of spectators, especially around the first turn - a 180-degree hairpin test of bike-handling skills and nerve. Aaron Schooler pushed his own breakaway so hard early in the Category 3/2 race that he lapped the field before the half-way mark, causing the commissar to halt the remainder of the race. Both Jaime Sparling and julie Beveridge hold onto their yellow jerseys as they do their best to rest and recover in preparation for the final Stage of Bike Fest 2009; the Tunnel Mountain Road race. The men will go 117 kilometres, with the women gearing up for their 52 kilometre race over the challenging and spectacularly scenic 13 kilometre course. 4 Paul Tichelaar (ERTC Revolution Cycle) all s.t. 40 Matthew O'Hagen (Westwood Cycle/Cannondale p/b Vision-Sports ) all s.t. 14 Brad Pilling (Ind) all s.t. 8 Travis Eltom (Ind) all s.t.